Hotel Jurys Inn Glasgow, Glasgow, United Kingdom - Lowest Rate Guaranteed! With a stay at Jurys Inn Glasgow in Glasgow (City Centre Glasgow), you'll be steps from Merchant City and 11 minutes by foot from George Square. 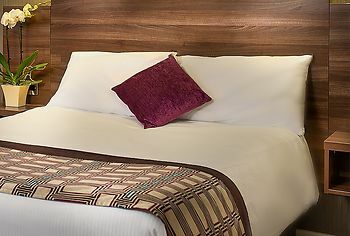 This 4-star hotel is 0.4 mi (0.6 km) from Buchanan Street and 0.4 mi (0.7 km) from O2 Academy Glasgow. Excellent value for money. Very impressed, would certainly be my first choice if staying in glasgow. Excellent breakfast choices. Central location. Clean modern rooms and hotel. The reception staff were all extremely pleasant and helpful, particularly as we requested a room change as my husband is a very light sleeper and our first room was looking right out onto one of the platforms in Central Station. The second room was comfortable enough although basic and clean. The greeting on arriving in the restaurant area for breakfast was perfunctory with no direction given to guests on what was to be expected. Guests are left to collect there own cutlery, napkins and tea/coffee. The choice of items was extremely limited and disappointing, asked for mushrooms and was told that it would be at least 15 mins until they were available. 3 staying in room - pre booked - only towels / cups for 2 persons. Initial call to reception to have items delivered to room not followed up. Had to call housekeeping next day to chase. Good size of room + very nice breakfast. Superb situated in town. The surroundings and staff were great. the welcome and array of breakfast options met everyones needs.I will deffinately be back.The water cooler and icer in all corridors was most welcome. We were very pleased with Jury's Inn, and will recommend it to any fellow Canadians who are travelling in Scotland. The reception staff were most helpful and friendly. Thanks for a good visit. Location. Comfortable bed. Morning tea.